British packaging firm GreenBottle has launched the world’s first paper wine bottle in the US with California wine producer Truett-Hurst, with a label designed by Stranger & Stranger. 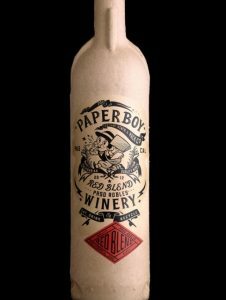 While Stranger & Stranger designed the label graphics, GreenBottle partnered with Truett-Hurst to develop the Paperboy wine product, the bottle for which is made from compressed recycled paper and weighs just 65g – a seventh of the weight of an average glass wine bottle. Paperboy will be the first paper wine bottle in the world to go on sale, making its debut in the US this week. GreenBottle’s managing director Mark Eaves told the drinks business: “We’re delighted to finally have our paper wine bottle on the shelf. A great concept has now become a viable reality. Paperboy is not only much lighter and more environmentally friendly than glass bottled wines, it’s a great quality wine too.